technews Tech Gaint Launches New Game Streaming Service! After much waiting and speculating, the search giant has finally launched the game streaming project named as Project Stream. The new video game streaming service is designed to run high-end PC games on the Google Chrome browser. The search giant has partnered with Ubisoft to bring the upcoming Assasin’s Creed Odyssey to your Chrome web browser. 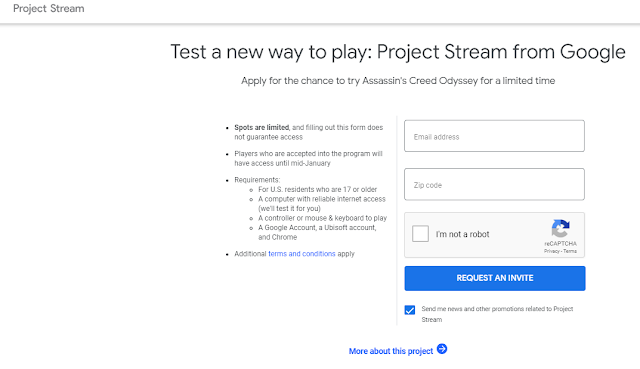 Users can sign up for Project Stream to test the upcoming game on the Chrome browser. However, only selected participants will be able to play the game during the trial period. The testing phase will begin from October 5th, and it will continue till January 2019. During this term, users won’t have to pay any charge for playing the game. Users need to have at least 25 Mbps of internet speed to stream the game on Chrome browser via Project Stream. Right now, the trial is only open for US users who are above 17 years in age. Users need to have both Google and Ubisoft account in order to avail the trial period. If this project turns out successful, then it could be a game changer for PC Gaming.